An Oleo Mac Olympyk 935f came into my possession. Cute little saw. Needs air filter and it looks to me like the oiler plunger is missing. The oiler body with spring is here but nothing to pump the oil. Sound right fellas? Hi Gang,I've got an Olympik 254 that I've been working on since July when I bought it.I bought another saw for parts & finally got the oiler out to put in my original saw.Now I've misplaced the fitting that holds the oiler in place.I believe it's made of aluminum & screws into the front of the saw.If anyone would have an extra one I'd gladly pay for it.Thanks! Update - I found an oil pump ring nut brand new,so I won't be needing any from anyone here.I do have some parts that I'd be willing to sell cheap.I have a top cover for a 254/264 w/switch,two BN oil caps,one extra felling spike,one 254 handle bar,one rear handle assembly, one BN air filter cover for 264 (I believe),& one 264F chain brake. Hi All,I just picked up asn Olympik 234 off Feebay for $14.It has very good compression & spark.I put some fuel mix down the carb & she fired right up.I located an air filter & cover for it,but after unpacking the saw I went to put the bar & chain on it & found that it's missing the bar plates.If anyone would have a set of them I'd greatly appreciate it if I could get them.I'll pay for them of course. Does anyone know which carb kit I need for a 971? You need to find out what carb you have in the saw first.Also,which saw brand do you have,Efco,Olympik,etc.? Was given a 950f super to try and rehab. Not very small engine repair saavy. Starter cord pulls really hard. Pulls fine with spark plug removed. Took muffler off. Black oil spitting out of cylinder into muffler. Some scoring inside. I hear a hissing noise when I pull the starter with the plug in, like it's struggling to pull in air. 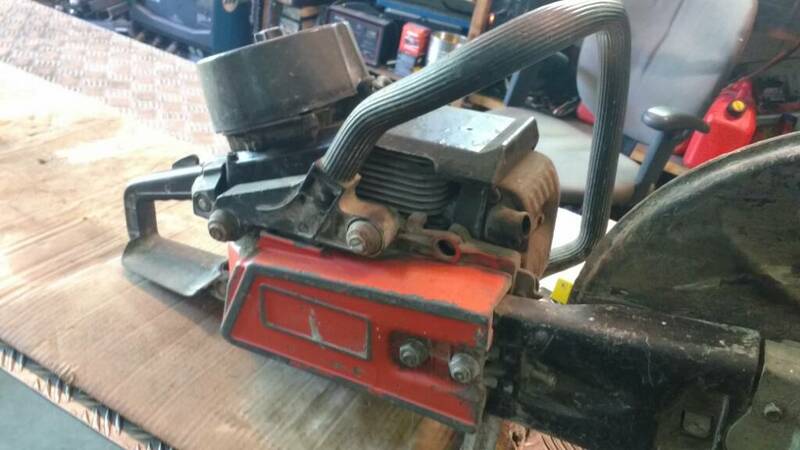 I bought a little 234 about 2 mo.ago.It was missing the air filter & cover & I managed to get them.I rebuilt the carb,it runs rough,but I found that the oiler isn't working.It's an automatic oiler & has no manual backup oiler.How do I find out what the problem is with the oiler? Just for fun (? ), I did a comp check on the three 264F I have. 185, 190 & 190. WOW! i'm a new member an i don't know surly where to post. I hope is ok i'm posting here. To me it looks pretty much like an Olympyk 264 equivelent. Ciupav Gheorghe and olyman like this. Make sure the oil line is solid and stable and is attached and the filter is clean inside the oil tank. That explains the problem I had with my 254 about 15 or so yrs.ago.The owner of the saw shop kept putting oilers in the saw.It'd oil when it was cold,but as soon as it got hot it'd stop oiling.I ended up scrapping the saw,but I've got a sneaking suspicion that I bought my old saw back for $20 & the oiler was missing.I never got around to putting an oiler in that saw yet.I pieced it together with a recoil from yet another 254 & rebuilt the carb. Hey guys, this seems to be the thread of people in the know about oleo mac saws, so I'll post a link to a thread I started. If anyone could help me identify these model #s it would be appreciated. Seems like info on these is in short supply. got a oly? chop saw couple wk ago. curious if anyone here can id. looks 272 & 284ish, what I can gather here. gonna try get pics on. Did you ever find a part #? Your picture is the first one I've seen matching some parts I've been trying to identify. 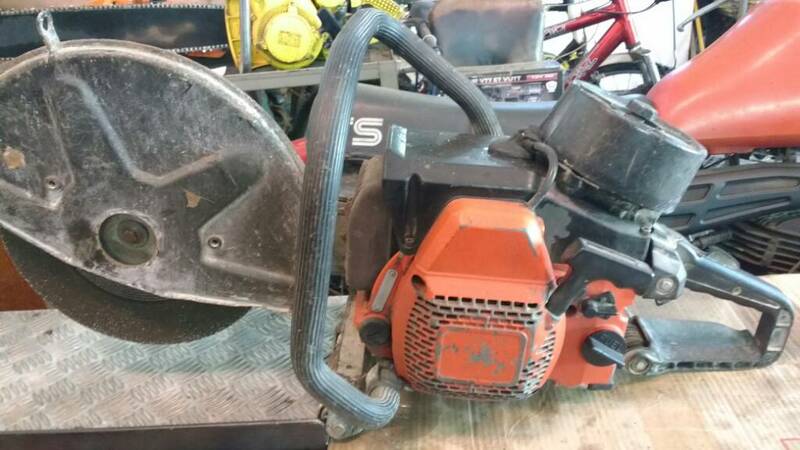 I assumed they were chainsaws, but now it makes sense that it's a chop saw. That's why I could never match a picture of the clutch cover.